When it comes to insect pollination, flowering plants get all of the attention. However, flowers aren't the only game in town. More and more we are beginning to appreciate the role insects play in the pollination of some gymnosperm lineages. For instance, did you know that many cycad species utilize insects as pollen vectors? The ways in which these charismatic gymnosperms entice insects is absolutely fascinating and well worth understanding in more detail. Cycads or cycad-like plants were some of the earliest gymnosperm lineages to arise on this planet. They did so long before familiar insects like bees, wasps, and butterflies came onto the scene. It had long been assumed that, like a vast majority of extant gymnosperms, cycads relied on the wind to get pollen from male cones to female cones. Indeed, many species certainly utilize to wind to one degree or another. However, subsequent work on a few cycad genera revealed that wind might not cut it in most cases. It took placing living cycads into wind tunnels to obtain the first evidence that something strange might be going on with cycad pollination. The small gaps on the female cones were simply too tight for wind-blown pollen to make it to the ovules. Around the same time, researchers began noting the production of volatile odors and heat in cycad cones, providing further incentives for closer examination. Subsequent research into cycad pollination has really started to pay off. By excluding insects from the cones, researchers have been able to demonstrate that insects are an essential factor in the pollination of many cycad species. What's more, often these relationships appear to be rather species specific. Cycadophila yunnanensis, C. nigra, and other beetles on a cone of Cycas sp. By far, the bulk of cycad pollination services are being performed by beetles. This makes a lot of sense because, like cycads, beetles evolved long before bees or butterflies. Most of these belong to the superfamily Cucujoidea as well as the true weevils (Curculionidae). In some cases, beetles utilize cycad cones as places to mate and lay eggs. For instance, male and female cones of the South African cycad Encephalartos friderici-guilielmi were found to be quite attractive to at least two beetle genera. Beetles and their larvae were found on male cones only after they had opened and pollen was available. Researchers were even able to observe adult beetles emerging from pupae within the cones, suggesting that male cones of E. friderici-guilielmi function as brood sites. Adult beetles carrying pollen were seen leaving the male cones and visiting the female cones. The beetles would crawl all over the fuzzy outer surface of the female cones until they became receptive. At that point, the beetles wriggle inside and deposit pollen. Seed set was significantly lower when beetles were excluded. Male cone of Zamia furfuracea with a mating (lek) assembly of Rhopalotria mollis weevils. For the Mexican cycad Zamia furfuracea, weevils also utilize cones as brood sites, however, the female cones go to great lengths to protect themselves from failed reproductive efforts. The adult weevils are attracted to male cones by volatile odors where they pick up pollen. The female cones are thought to also emit similar odors, however, larvae are not able to develop within the female cones. Researchers attribute this to higher levels of toxins found in female cone tissues. This kills off the beetle larvae before they can do too much damage with their feeding. This way, the cycad gets pollinated and potentially harmful herbivores are eliminated. Beetles also share the cycad pollination spotlight with another surprising group of insects - thrips. Thrips belong to an ancient order of insects whose origin dates back to the Permian, some 298 million years ago. 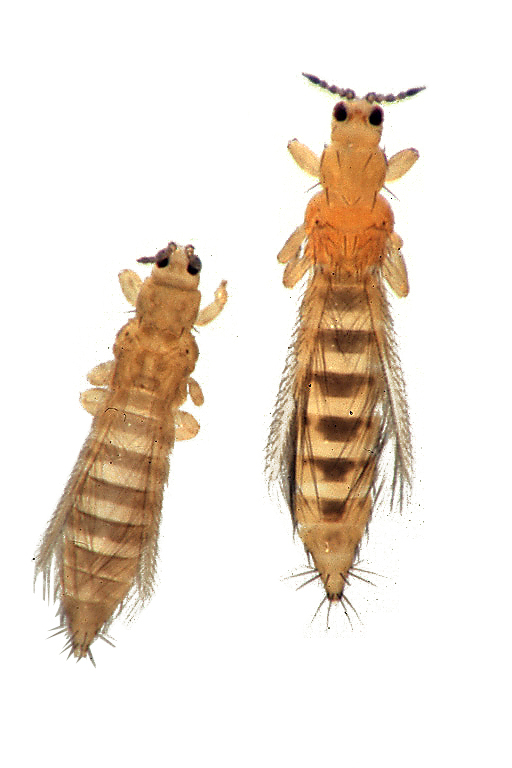 Because they are plant feeders, thrips are often considered pests. However, for Australian cycads in the genus Macrozamia, they are important pollinators. Thrip pollination was studied in detail in at least two Macrozamia species, M. lucida and M. macleayi. It was noted that the male cones of these species are thermogenic, reaching peak temperatures of around 104 °F (40 °C). They also produce volatile compounds like monoterpenes as well as lots of CO2 and water vapor during this time. This spike in male cone activity also coincides with a mass exodus of thrips living within the cones. Thrips (Cycadothrips chadwicki) leaving a thermogenic pollen cone of Macrozamia lucida. Thrips apparently enjoy cool, dry, and dark places to feed and breed. That is why they love male Macrozamia cones. However, if the thrips were to remain in the male cones only, pollination wouldn't occur. This is where all of that male cone metabolic activity comes in handy. Researchers found that the combination of rising heat and humidity, and the production of monoterpenes aggravated thrips living within the male cones, causing them to leave the cones in search of another home. Inevitably many of these pollen-covered thrips find themselves on female Macrozamia cones. They crawl inside and find things much more to their liking. It turns out that female Macrozamia cones do not produce heat or volatile compounds. In this way, Macrozamia are insuring pollen transfer between male and female plants. Pollination in cycads is a fascinating subject. It is a reminder that flowering plants aren't the only game in town and that insects have been providing such services for eons. Additionally, with cycads facing extinction threats on a global scale, understanding pollination is vital to preserving them into the future. Without reproduction, species will inevitably fail. Many cycads have yet to have their pollinators identified. Some cycad pollinators may even be extinct. Without boots on the ground, we may never know the full story. In truth, we have only begun to scratch the surface of cycads and their pollinators. A subset of plants have evolved the ability to produce heat, a fact that may come as a surprise to many reading this. The undisputed champions of botanical thermogenesis are the aroids (Araceae). Exactly why they do so is still the subject of scientific debate but the means by which heat is produced is absolutely fascinating. The heat producing organ of an aroid is called the spadix. Technically speaking, a spadix is a spike of minute flowers closely arranged around a fleshy axis. All aroid inflorescences have one and they come in a wide variety of shapes, colors, and textures. To produce heat, the spadix is hooked up to a massive underground energy reserve largely in the form of carbohydrates or sugars. The process of turning these sugars into heat is rather complex and surprisingly animal-like. Cross section of a typical aroid inflorescence with half of the protective spathe removed. The spadix is situated in the middle with a rings of protective hairs (top), male flowers (middle), and female flowers (bottom). It all starts with a compound we are rather familiar with - salicylic acid - as it is the main ingredient in Aspirin. In aroids, however, salicylic acid acts as a hormone whose job it is to initiate both the heating process as well as the production of floral scents. It signals the mitochondria packed inside a ring of sterile flowers located at the base of the spadix to change their metabolic pathway. In lieu of their normal metabolic pathway, which ends in the production of ATP, the mitochondria switch over to a pathway called the "Alternative Oxidase Metabolic Pathway." When this happens, the mitochondria start burning sugars using oxygen as a fuel source. This form of respiration produces heat. 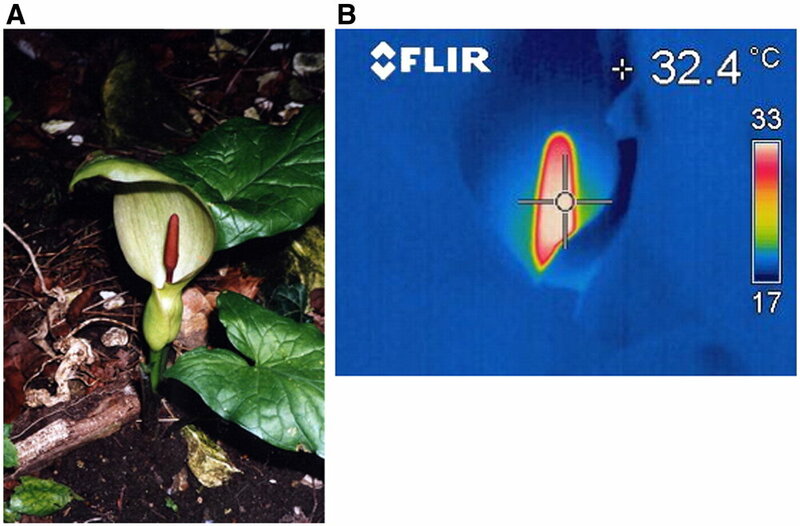 Thermal imaging of the inflorescence of Arum maculatum. As you can imagine, this can be a costly process for plants to undergo. A lot of energy is consumed as the inflorescence heats up. Nonetheless, some aroids can maintain this costly level of respiration intermittently for weeks on end. 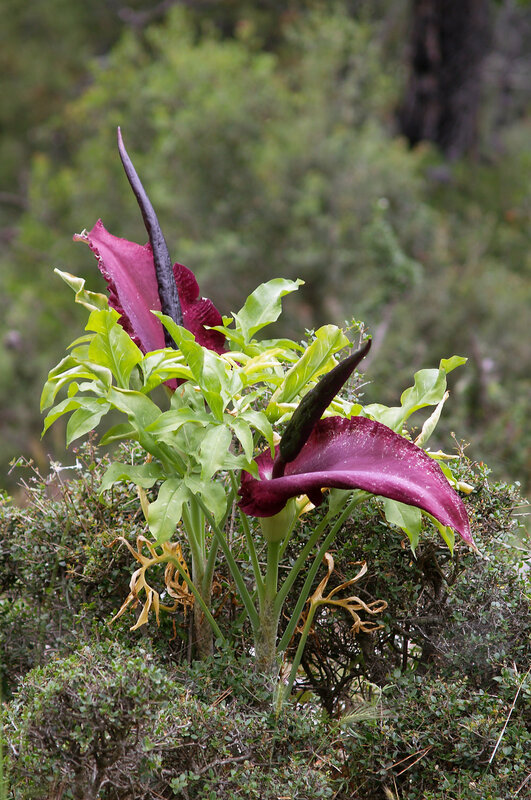 Take the charismatic skunk cabbage (Symplocarpus foetidus) for example. Its spadix can reach temperatures of upwards of 45 °F (7 °C) on and and off for as long as two weeks. Even more incredible, the plant is able to do this despite freezing ambient temperatures, literally melting its way through layers of snow. For some aroids, however, carbohydrates just don't cut it. Species like the Brazilian Philodendron bipinnatifidum produce a staggering amount of floral heat and to do so requires a different fuel source - fat. Fats are not a common component of plant metabolisms. Plants simply have less energy requirements than most animals. Still, this wonderful aroid has converged on a fat-burning metabolic pathway that puts many animals to shame. P. bipinnatifidum stores lots of fat in sterile male flowers that are situated between the fertile male and female flowers near the base of the spadix. As soon as the protective spathe opens, the spadix bursts into metabolic action. As the sun starts to set and P. bipinnatifidum's scarab beetle pollinators begin to wake up, heat production starts to hit a crescendo. For about 20 to 40 minutes, the inflorescence of P. bipinnatifidum reaches temperatures as high as 95 °F (35 °C) with one record breaker maxing out at 115 °F (46 °C)! Amazingly, this process is repeated again the following night. It goes without saying that burning fat at a rate fast enough to reach such temperatures requires a lot of oxygen. Amazingly, for the two nights it is in bloom, the P. bipinnatifidum inflorescence consumes oxygen at a rate comparable to that of a flying hummingbird, which are some of the most metabolically active animals on Earth. The world's largest inflorescence belongs to the titan arum (Amorphophallus titanum) and it too produces heat. Again, why these plants go through the effort of heating their reproductive structures is still a bit of a mystery. For most, heat likely plays a role in helping to volatilize floral scents. Anyone that has spent time around blooming aroids knows that this plant family produces a wide range of odors from sweet and spicy to downright offensive. By warming these compounds, the plant may be helping to lure in pollinators from a greater distance away. It is also thought that the heat may be an attractant in and of itself. This is especially true for temperate species like the aforementioned skunk cabbage, which frequently bloom during colder months of the year. Likely both play a role to one degree or another throughout the aroid family. What we can say is that the process of plant thermogenesis is absolutely fascinating and well worth deeper investigation. We still have much to learn about this charismatic group of plants. I used to think mistletoes were largely a southern phenomenon, preferring regions with mild or even no winters. Then I was introduced to the dwarf mistletoes in the genus Arceuthobium. These odd parasites can be found growing throughout the northern hemisphere. Their affinity for conifers has landed them on the watch list of many a forester yet, despite their economic implications, the dwarf mistletoes are fascinating parasitic plants. First and foremost, these are aggressive little plants. They vary in their host specificity. Some species can grow on a wide variety of conifer species from Abies balsamea (balsam fir), Larix laricina (American larch), to Pinus strobus (eastern white pine), whereas others are more specialized, preferring only spruces (Picea spp.). Regardless, infestations of these parasites can do some interesting things to conifer stands. Similar to other mistletoes, the dwarfs are stem parasites. They penetrate into their hosts vascular tissues and set up shop, sucking up water and photosynthates and giving nothing in return. Because of this, large infestations can seriously drain their host trees as they themselves have reduced or even no photosynthetic capacity. Additionally, they interfere with nutrient and hormone flows throughout the branches of their host. Such disruptions can result in the formation of dense clusters of branches called "witches brooms." Some dwarf mistletoe infestations can become so intense that they effectively girdle their host tree. In natural settings, this serves an ecological function. By weakening their hosts, dwarf mistletoes can leave room for other plant species to take root. They also keep one species from becoming too dominant. As such, mistletoe infestations can actually increase plant diversity in the long run. Dwarf mistletoe infestations only become an issue once humans get involved. They can cause serious financial issues for foresters as well as damage important or valued specimen trees. In our highly fragmented forests, their natural behavior can get in the way of human ideals. All of this talk of damage can distract us from just how amazing some of these species really are from an organismal standpoint. For instance, the lodgepole pine dwarf mistletoe, Arceuthobium americanum, is capable of thermogenesis. Unlike the other examples of thermogenesis in the plant world, this has nothing to do with flowers. Instead, thermogenesis in A. americanum is used as a seed dispersal agent. The dwarf mistletoes don't rely on fleshy fruits to get their seeds from one tree to another. Instead, they utilize ballistic means. As their seed pods mature, they gradually swell. Once pressure is great enough, the seed pods erupt, sending their sticky seeds flying through the canopy at speeds of up to 62 mph (100 km/h)! If lucky, the seeds will stick to the branches of a viable host or be transported there in the fur or feathers of an animal. For A. americanum, the eruption of its seed pods is triggered by heat. Using specialized metabolic pathways at the cellular level, A. americanum is able to heat its seed pods up to ~2 °C warmer than its surroundings, thus triggering its pods to explode. Pretty incredible for a species so often labelled as a pest.